Camp can be one of the highlights of any child’s summer. But what happens when special needs come into play? Even with its long history in the community, Camp Aldersgate is a revelation to most people in Little Rock. Shelby Sides and Jakayla Woods are able to enjoy summer camp activities in an environment that caters to their medical needs. Chikiki Hill was heartsick the first time she dropped off her daughter Shikivia "Jakayla" Woods, now 16, for a weekend at Camp Aldersgate four years ago. "The first time it was so difficult. It’s hard for parents to let their kids go," she said. "My son was like, ‘I’m sick. I want my sister to come back.’ We laid around the whole weekend." When her phone buzzed, Woods couldn't believe what she was seeing. Jakayla, who has cerebral palsy, was definitely not sharing in her family's down mood; far from it. "The first weekend, they sent me pictures of her ziplining. She ziplined her first day," said her mom, smiling at the memory. Today, Jakayla regularly attends monthly weekender camps as well as Camp Kota in the summertime. Being apart for that time is easier for mom than it used to be. "It’s a nice break, but mainly I just want her to enjoy herself because it’s kind of hard for me to find something for her to do, especially money-wise," Chikiki said. "I want her to enjoy herself and do different things." "She loves it; she makes different friends with people just like her. She’s great friends with some of the counselors. She even keeps in contact with some of the counselors outside of camp." "When you go there, everyone is the same. You know what I mean?" 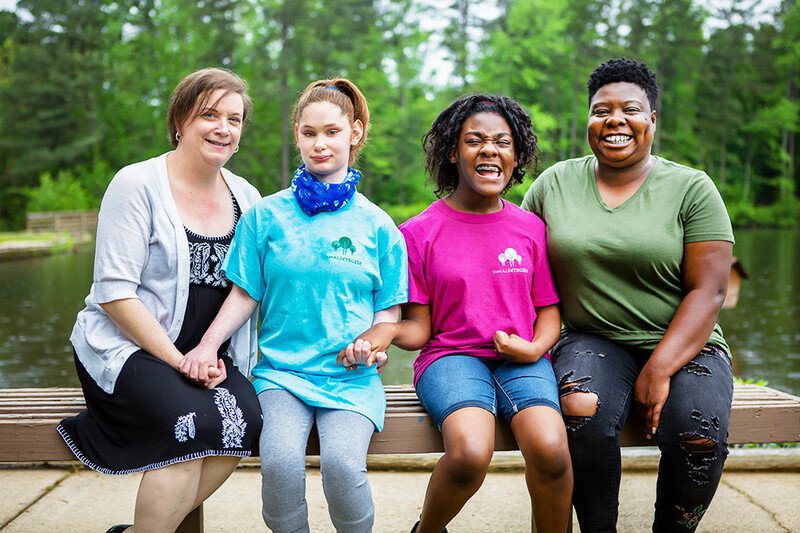 Stacey Sides and her daughter, Shelby, and Jakayla Woods and her mother, Chikiki, have all benefitted from Camp Aldersgate. For the girls, it has taught them social skills and given them fun, educational experiences. For their moms, it's a time they know people they trust are caring for their kids. Even with its long history in the community, Camp Aldersgate is a revelation to most people in Little Rock. The first thing you notice is its size – 100 acres of pine and hardwood and sunshine so pristine you immediately forget some of the city's busiest developments lie just beyond its gates. "We’re nestled pretty nicely in the heart of Little Rock," said Ali Miller Berry, director of programs. "The city has protected us so we’re able to keep a natural buffer; you don’t really notice you’re in the middle of the city." Of course, Camp Aldersgate didn’t start out as an urban forest oasis; when founded in 1947, the place seemed a long way from the city both in location and, given the attitudes of the day, in mission. "A group of United Methodist women saw a need for people of all races to be able to meet peacefully, racial tensions being at the forefront of societal issues," Miller Berry said. "They came together, they wrote a grant through United Methodist Women’s National Foundation and they bought this land. It used to be a turkey farm and it was six miles outside of the city. We were way out there." In fact, as one of the first places in Arkansas to cater to all – including inter-racial summer camps and other events – Camp Aldersgate might as well have been another planet. Over the years, it maintained that staunch spirit, equally welcoming to mainstream religious and fellowship groups as to people struggling with substance abuse. But the true destiny of the camp, as a haven for children and youth facing a variety of health issues, came along in 1971. "A local physician came to us and said, 'I have 12 kids who can’t go to camp anywhere else because asthma was not well-controlled,'" Miller Berry said. "He said, ‘If I stay on-site, can they come to summer camp and I’ll provide medical care?’ That’s really where our mission took off." 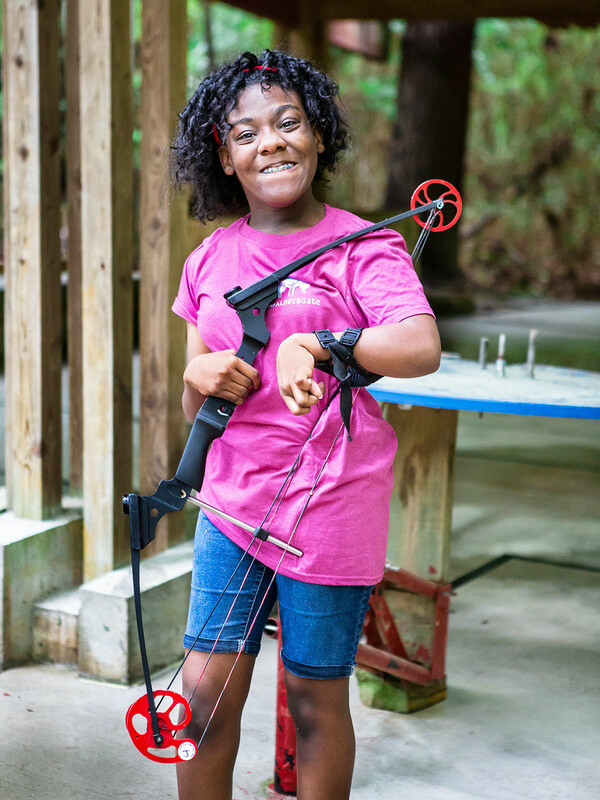 Campers get to enjoy all sorts of activities — including time outside to try their hand at archery. 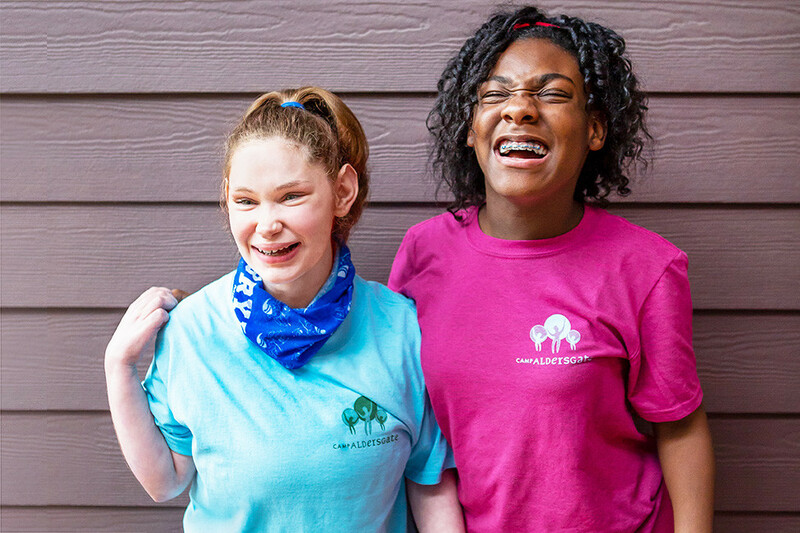 Today, Camp Aldersgate hosts camps for children 6 to 18 with special needs or medical diagnosis, a sample of which includes bleeding disorders, kidney diseases and cancer. There are also weekend camps held once per month, again, tailored to children sharing similar health circumstances and a summer camp, Camp Kota, that includes children with and without special health needs. Camp Aldersgate has also provided day camps for seniors of limited means since the 1970s. Seniors Day Out provides meals, activities and socialization every Thursday from August to May. Other camps and events are held in partnership with community organizations and groups such as school systems. A partnership with the Arkansas Army Guard provides a spring break retreat for kids whose parents are deployed or soon will be. Another, Camp Sunshine, hosts young burn survivors sponsored by Arkansas Professional Firefighters Association and Children’s Hospital. "In terms of our direct service of volunteers and our campers, we serve about 1,700 per year," Miller Berry said. "When you factor in all those little camps, that number is more." During weekend and summer camps, activities include time indoors for special projects like art. The camps are staffed by personnel specially trained in the particular population each camp serves. During peak summertime, the team numbers about 60 paid staffers and 300 volunteers through Camp Aldersgate's volunteer development program. "For kids 14 and up who provide services for us and help us run our programming, we focus our intentions back on how to help them," Miller Berry said. "They learn how to interview for the first time, turn in paperwork, become professionals. But most importantly, they become advocates for kids with special needs as their peers." "In fact, we also have a lot of counselors that started as youth volunteers at age 14. They needed service hours, this was a good place and then they got hooked and come back." Counselors aren't the only ones who form a tight community. Campers routinely return year after year, creating close bonds with fellow campers and staff. Stacey Sides, mother of camper Shelby Sides, says the programs are a big part of her daughter's life. Shelby was born with cerebral palsy and microcephaly. "I hesitated sending her because I’m an overprotective mom," she said. "I finally caved, you know, try this out and see what happens. I really expected phone calls, text messages, something, because I wasn’t sure how she would do. I was paranoid the whole weekend, but I had no reason to be." "Her social skills have gotten so much better. Even her teacher said something last year because she’s so much better with people her own age. (Camp) helps the kids learn to interact with each other." 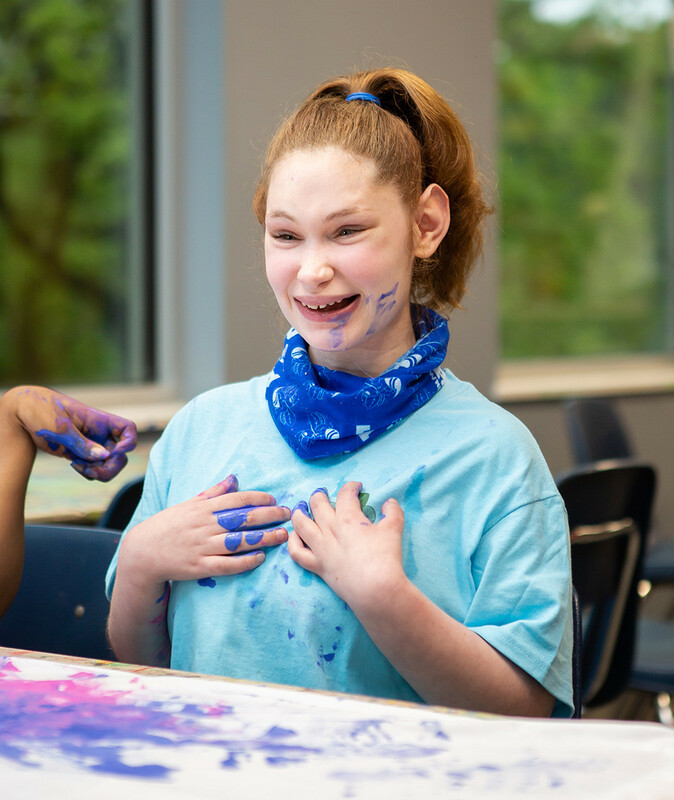 Once Stacey saw how well-adjusted Shelby was, she was able to appreciate another benefit of Camp Aldersgate programs as a respite for parents of children with special needs. "Life takes its toll, you get tired," Stacey said. "Shelby, I miss her when she’s gone, but I do need a break. I never realized how much I needed a break until I got one." Miller Berry said the mission of Camp Aldersgate continues to evolve through new camps that reflect the needs of the community. Camp Conquer, started last year, helps train high school peer leaders to identify and intervene when a classmate is struggling with thoughts of suicide. This summer, the inaugural Camp Hope will welcome kids who are survivors of domestic abuse, in partnership with Little Rock's Women and Children First. For Ali, like a many staffers here, the work is not just rewarding, it's highly personal. "I come from a wonderful family and my best friend in fifth grade had a little brother with Down syndrome," she said. "My dad could see me kind of watching him and trying to process and understand. And he said, ‘Ali, people like Thomas are angels sent from baby Jesus to show you what life’s supposed to be like.’ That truly hit home." "I started to watch over the next few years and I think I really understood that sense of joy and love and across the board acceptance. I think it rang true to me that the most accepted you’ll ever feel is by somebody who has not felt accepted and how they can offer love and that sense of well, come on in, you’re welcome here."